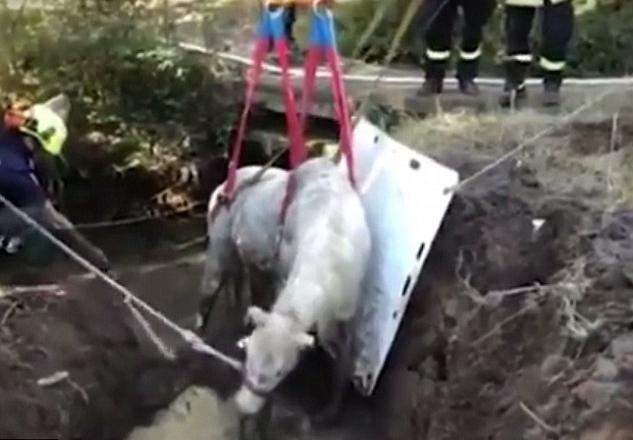 A 35-year-old horse that became stuck in a creek bed has been freed after rescue teams worked for seven hours to save it. 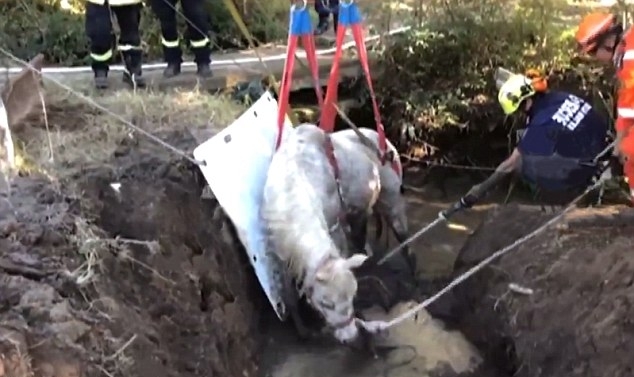 Mishna the mare, who has already lived well beyond the 30-year average for a horse, will see another day after being rescued from a creek bed near Galstone, 36 kilometres north-west of Sydney. The horse's owner said the animal had been stuck since 7am and had called NSW Fire and Rescue after they realised, 7News reported. Scott Hayward, who was part of the rescue team, said Mishna's age coupled with her size made getting it out difficult. 'We were going to try and walk it out but it was just physically too exhausted,' he said. Getting Mishna out became a full team effort with 20 recuse officers including the SES police and a new recruit, who was off duty at the time, called in to help. Mr Haywood said the new recruit brought in his own digger to assist with the rescue. He said the team from Blacktown have a 'technical vehicle' for larger animals that was also bought to the site to help with the effort. Just as it all started to look like a straight forward operation the sides of the banks fell in on Mishna. 'The banks of the creek started to collapse so that added some more difficulty to it,' Mr Haywood said. At this stage she was suffering from severe exhaustion and the crew were forced to sedate her so they could dig her hooves out of the mud. Throughout the ordeal a vet was by her side and has given Mishna the all clear to go back to enjoying her retirement. Responses to "Rescue crews work for hours to free beloved 35-year-old horse"